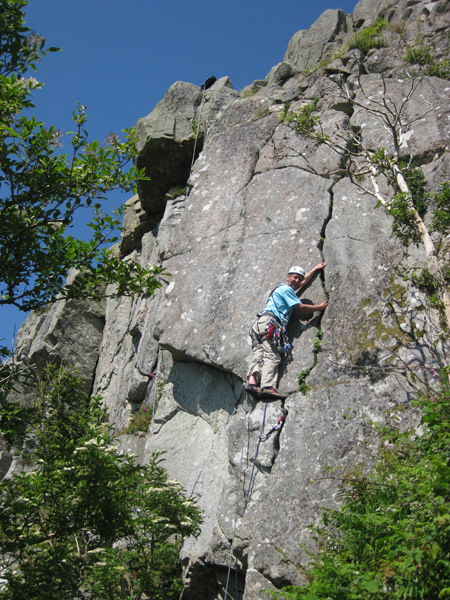 Go Climbing Information about the services I can provide as a Mountaineering Instructor. We recently cleaned a few of the worst sections of overgrown routes, including the gorse bushes on Crackshot and Hollowstones Chimney and the worst of the ivy off of Gramercy, Bullet and Twin Cracks.... these routes just need a bit more traffic now to keep them flowing well.! 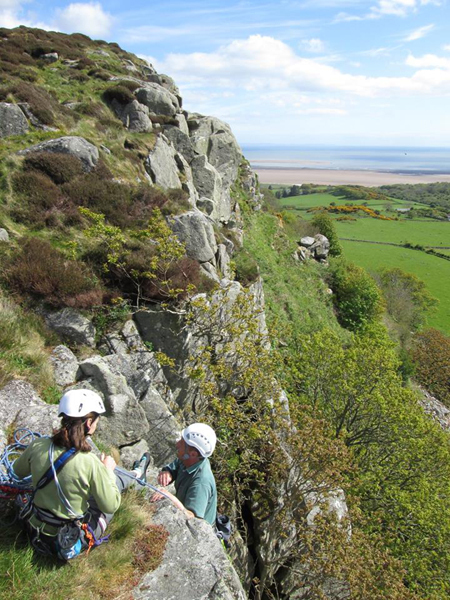 Introduction Clifton is an excellent wee crag in Kirkcudbrightshire, near the town of Dalbeattie and about 20km southwest of Dumfries. It's west facing, gets lots of afternoon and evening sunshine, has a short approach over two fields and has great views over the Solway Firth to St. Bees Head. Certain areas are affected by birds nesting in the spring. Driving Directions From Dumfries it is best to take the A710 thru New Abbey, Kirkbean and then Caulkerbush. The B793 goes off to the right here, but stay on the A710. About 1 mile further along the A710 is the turn off (right) for Clifton, signposted Southwick Graveyard. You then drive about one kilometre up this very narrow road, stopping about 100m past the cemetery at a Passing Place. From Castle Douglas and Dalbeattie follow the B793 to come down the narrow road to Clifton from the north, or more simply follow the A710 coast road through Colvend and Sandyhills to reach the same turning mentioned above, but the Southwick Graveyard sign is hard to spot from this direction. Access The crag is on a hill east of the road and is obvious. To get to the crag cross a wee granite stile opposite the Passing Place immediately north of Upper Clifton farm. Cross the first field straight towards the crag, passing near a fenced-off barn. A second stile near the highest point of this field leads to the second field. Cross this second field diagonally left to a gate below the far left (north) end of the crag, then follow a short path through bracken up to the foot of Hollowstones Wall. This is definitely the best approach for all routes at Clifton. Even those routes on the buttresses at the far right, southern, end are best approached this way initially. Any attempt at a more direct approach is likely to lead a to a long and difficult battle with boulders and brambles!!! From the base of Hollowstones Wall you can quickly reach the top of the crag via the descent path around the north end of the crag, then stroll easily along the top of the crag to the other buttresses. For routes as far along as Red Slab and DIY you can approach from the gearing up area via paths through the trees and brambles at the foot of the crag - these are usually well enough travelled to be free of brambles. Guidebook Included on this page are a selection of the best routes (in my opinion) at the crag. I climb regularly at Clifton and have pretty much climbed everything here except the two E4's. For a definitive list of all the climbs at Clifton see the SMC published Lowland Outcrops guidebook. The North End is easily the most popular area of Clifton, and there is enough climbing here to keep most folk going all day. Most routes can be accessed by paths running through the trees below the crag, but the Fingerlust area is probably best reached by going up and around. The descent path for nearly all routes lies just to the left of the photo - there are two commonly used paths - you can come down more steeply (an easy scramble), or less steeply (through the gorse) depending on how far north you go. More detail of these different areas, including route topos, are further down this page, or reach them from the links below. These three buttresses are separated from the right hand (south) end of the first photo by about 50-100m. further right still is the excellent Slab. All of these are best approached along the top of the crag from the north. Either abseil in to these buttresses, or descend (all three of them) on the right looking down - i.e. the left hand side looking at this photo. Finishing Tour de Force, a great Clifton VS 4c, on a sunny May afternoon. The next main area along is known as Jigsaw Buttress. It is well hidden by trees in summer but contains several good routes including the intriguing Liplet. Also included on the left of this diagram are a couple of good routes just right of Dirl Chimney, these are Gibbon in Wonderland and Tour de Force. Gibbon takes the big obvious fist size crack through the roof, bridge or jam according to taste... Tour de Force starts slightly to the right climbs the steep wall behind the branch (zig-zagging is the best technique here), then the right facing overlap and, after a hard move the final groove. It is quite hard to see the line from below. Liplet is one of the classics at Clifton, a bewilderingly hard severe the first time you try it, but it does get easier with knowledge. The next area along is the Main Wall. Climbs 1 to 5 start from an exposed ledge that can be gained from either end. Dave McNicol on Red Slab, VS 5a. Beyond the main wall there is no climbing for 100m or so until you get to the buttresses of Clifton South. South of the main crags are a number of smaller isolated buttresses. Some of the routes here, such as Twin Cracks and Jugular Vein, should not be missed. Approach along the top of the crag. First to be reached, about 50m before Twin Cracks and marked by a large grassy bay at the top, is the previously overlooked area of Little Clifton. This has one good route, the 10m slab of nice granite taken by Piece of Cake and various other routes of interest only to those who have climbed everything else...!. Descend this buttress on the right (facing out), i.e. the true north. As you walk south the next outcrop you encounter is the Twin Cracks Buttress. There are several very good climbs here, particularly Twin Cracks itself. Just above the crux on The Groove, Main Wall at Clifton. A hundred metres or so further south still there is more excellent rock climbing on Jugular Vein Buttress, most of the routes here are pretty hard. Unbelievably The Slash was given only VS, 4c a few years ago, personally I find it quite a bit harder than several of the guidebook E1's. The best approach to these routes is by abseiling down the line of the Slash, a third rope for rigging this abseil is very useful as the belays are a long way back. Descending to the base of the crag on foot is now difficult and seriously overgrown. Beyond this buttress there is one further area, Sunset Slab. It has some fairly bold slab climbing quite different in character to other areas of Clifton. As with all the buttresses at Clifton the best approach is along the top of the hill from the north end. 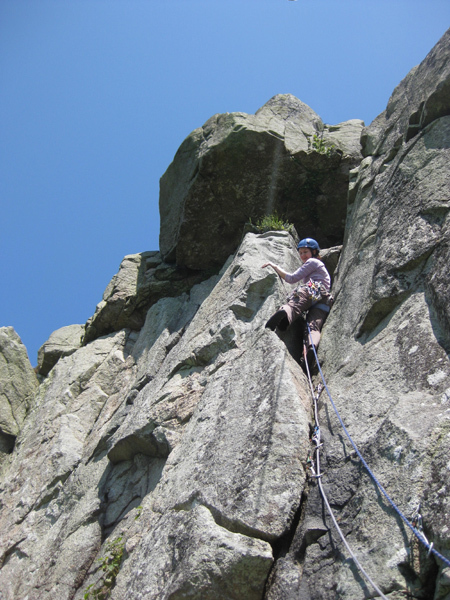 Then either abseil in to a hanging belay on small wires above the sea of gorse bushes or (easier!) downclimb on the right facing out. Parts of the slab are quite lichenous, but the holds needed to climb these routes are brushed clear by myself every year or two. Sunset, VS 4c, in particular is a really nice technical route, it starts 1m right of the central vertical crack (which is Crack Up), climbs to the horizontal break and then on up and slightly right on really nice small pockets and ledges. Frictional Belief, E2 5b, gives good independent climbing, although if you are the type of climber who likes to place runners you will have to weave around a bit (side runners reduce the grade to E1 5b). Further right are one or two poor quality routes. Ian Brown seconding on the first ascent of Frictional Belief, E2 5b. Clifton Farm Accommodation near Clifton Crag. Galloway Climbing An excellent set of web pages run by Stephen Reid of Needlesports with some good Galloway climbing information, including many new routes we did together in the last few years. Excellent topo diagrams of some of the newer climbing areas. Climbing Elders Crack on a perfect Clifton evening.